SPOKANE, Wash. – In a resounding affirmation of the continuing success of its $250 million Gonzaga Will capital campaign, the Gonzaga University Board of Trustees has approved the investment of more than $36.3 million to construct a new Jesuit Residence, a home and spiritual haven for Jesuits, and the Center for Athletic Achievement to support student-athletes. When President McCulloh announced the launch of the Gonzaga Will campaign last October, he thanked the unprecedented generosity of more than 23,000 supporters for the $183 million that had been raised at that time, which included an extraordinary $55 million bequest from the late Miss Myrtle Woldson, a Spokane resident and lifelong community philanthropist. Woldson directed $30 million to design and build the Myrtle Woldson Performing Arts Center at Gonzaga and $25 million to establish a transformational scholarship fund to help ensure access to a Gonzaga education for talented, high-financial-need students. 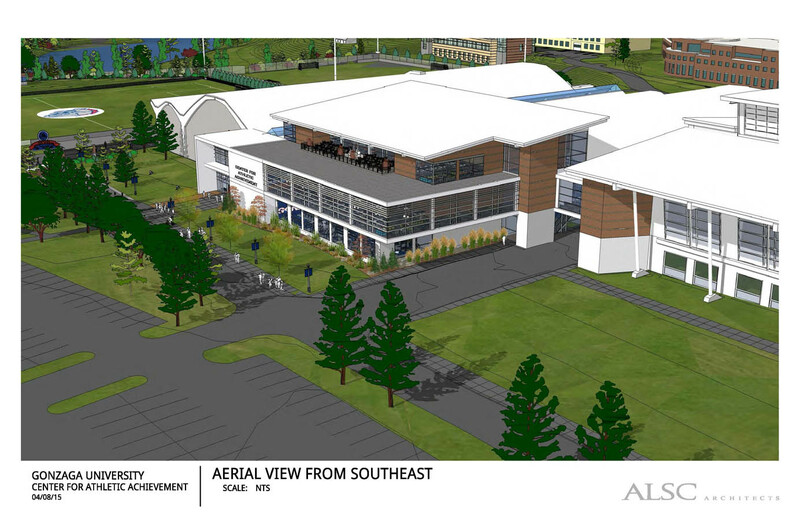 In addition to the Jesuit House and Center for Athletic Achievement, fundraising efforts are underway for a proposed Interdepartmental Sciences and Engineering facility. To meet growing student interest in science, technology, engineering and mathematics [STEM] fields, a state-of-the-art facility will prepare the next generation of innovators, attract top-notch faculty and conduct industry-leading research. At the trustees’ meeting, President McCulloh also shared that the campaign has surpassed $212 million and expressed deep appreciation for the exceptional benefaction of more than 30,000 contributors to the campaign. “This is Gonzaga Will in action. We are 85 percent toward our campaign goal. On behalf of everyone at Gonzaga, I would like to express profound gratitude to all those whose commitment is making our institution a place of creativity, innovation and inspiration,” President McCulloh said. The 36,074-square-foot Jesuit Residence will be built at the northwest corner of Boone Avenue and Astor Street as part of Gonzaga’s commitment to its mission as a Catholic and Jesuit institution. The facility, with an estimated cost of $12.3 million, will maintain a thriving and highly visible presence of Jesuits on Gonzaga’s campus. It will serve as a home for Jesuits in residence, include reflective space to serve Jesuits seeking retreat, provide appropriate office and work space, and link the central life of the Jesuit community with Gonzaga students, faculty and staff. BAR Architects of San Francisco along with BWA Architects of Spokane are architects for the project, which is expected to open in early fall 2017. 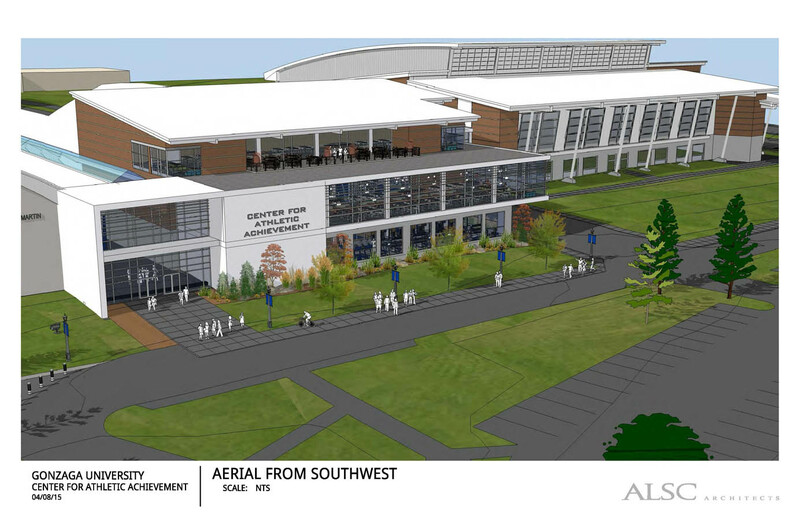 The 51,240-square-foot Center for Athletic Achievement, to be built directly south of the Martin Centre, will help student-athletes succeed in competition, in the classroom and in the community. 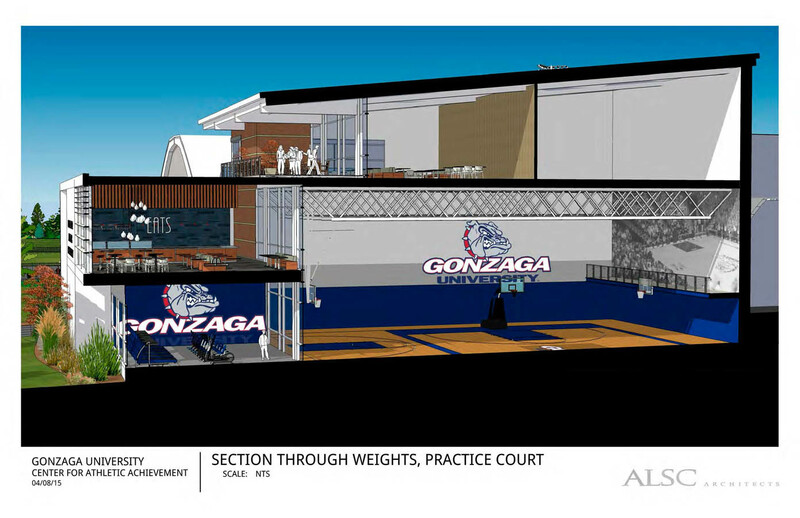 With an estimated cost of $24 million, the building will house student-athlete support services, a weight room, nutrition center, basketball practice court, Gonzaga Athletics Hall of Fame, and multiple meeting areas. Combined with spaces in the Martin Centre and McCarthey Athletic Center, the building will provide Gonzaga student-athletes with among the finest facilities and support services in the nation. ALSC Architects of Spokane is the architect for the project, which is expected to open in early fall 2017. For more information about these projects, contact Mary Joan Hahn at (509) 313-6095 or Peter Tormey at (509) 313-6132.